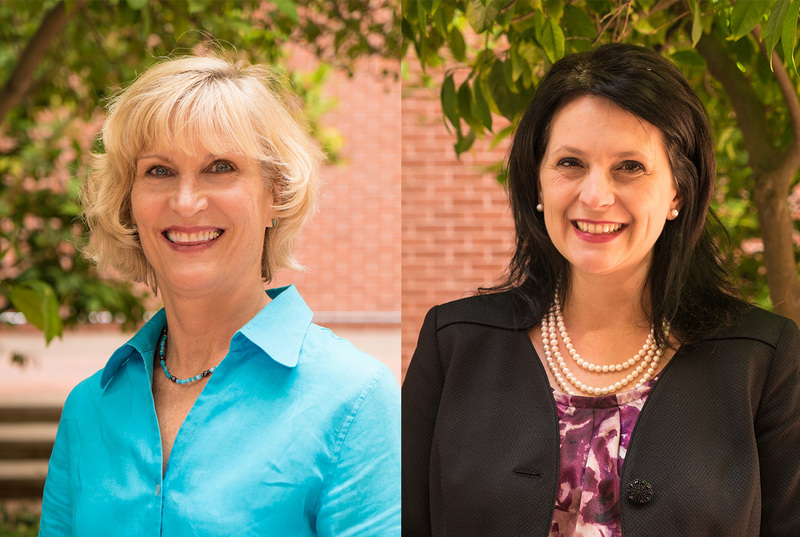 Sheila Gephart, PhD, RN, and Kimberly Shea, PhD, RN, CHPN, both professors at the University of Arizona College of Nursing, have been inducted as fellows into the Western Academy of Nurses. Established in 1989 by the Western Institute of Nursing (WIN), a collaborative of collegiate nursing schools and health-care agencies in 13 Western states, the Western Academy of Nurses (WAN) recognizes and honors nurses who have achieved superior accomplishments in the realm of direct care nursing practice, education or research. Membership in WAM is by nomination. Drs. Gephart and Shea will be inducted April 11. Dr. Shea has been a nurse for more than 25 years, including more than 15 in hospice care. As a nationally funded nurse-scientist, she investigates technology-based delivery of health care in patients’ homes. She holds four degrees from the UA and is nationally certified as a hospice and palliative care nurse. Dr. Shea conducts research that combines serious illness care (palliative and hospice) and technology, primarily in residential settings. Currently, her studies focus on tele-palliative care that uses video conferencing software, installed on a mobile device, to improve communication, reduce stress and minimize time with agonizing symptoms. “Dr. Gephart’s collaborative research, which uniquely advances evidence-informed practice, has had enormous impact on other researchers and the students/scholars she mentors,” said nominator Janice D. Crist, PhD, RN, FNGNA, FAAN, associate professor at the UA College of Nursing. Dr. Gephart has been a nurse for 20 years and has been a nurse scientist since 2012. She studies technical and parent-engaged solutions to reduce the burden of necrotizing enterocolitis, a devastating disease that affects the intestines of premature infants. Her methodological expertise in spreading innovations using informatics, especially clinical decision support technologies, has included algorithm development and testing of tools to measure electronic health record related unintended consequences. Her research has been funded by the Agency for Healthcare Research and Quality, Robert Wood Johnson Foundation, National Institute of Nursing Research and the National Library of Medicine. She is an active member of the NEC Society Scientific Advisory Council, the International Neonatal Consortium and the editorial board of Advances in Neonatal Care.